This outstanding potato has a waxy yellow skin and makes delicious salads, gratins, stews, and scalloped potatoes layered with cheese. Its sweet, buttery flavor is attractive to gourmet cooks and potato lovers alike! Be sure to try it simply roasted with olive oil, salt, and pepper, or cooked, cubed, and mixed into your favorite potato salad recipe. Each potato is a medium size and varied in shape, but is often oblong and slightly tapered toward each end. 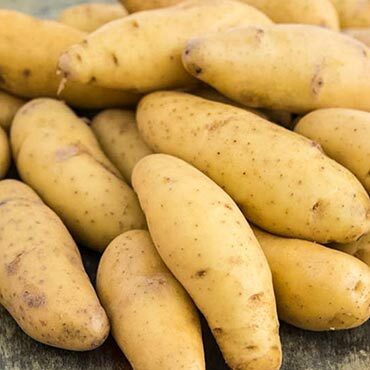 Resistant to Scab, Yellow Finn is the longest-storing potato we have available. Plant it in fertile, well-drained, sandy loam soil for best results. 80-100 days to maturity. Height: 24 - 36 inches. Spacing: 12 to 15 inches apart with 30 - 36 inches between rows. Depth: 3 to 5 inches. Days to Maturity: 80 - 100 days. Main season variety. Fruit: Tan skin, yellow flesh, shape varies, medium size. Soil Preference: Fertile, well-drained sandy loam soil. pH 4.8-5.4. Will grow in higher pH but sometimes will become scabby. Seed Count: 2 lbs. of seed potatoes will make approximately 10 - 15 potato sets when cut and will plant a 10 - 15 ft row.